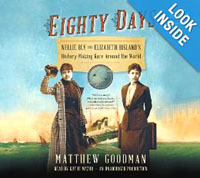 On the same day in 1889, two women left New York City with the same goal—to circle the globe in 80 days or fewer. The two women could not have been more different. Nellie Bly, a fearless reporter for The World newspaper had made her reputation by writing daring exposés where she went undercover, reporting abuses and social injustices which shocked the nation. Elizabeth Bisland was a genteel Southern woman who wrote literary pieces for Cosmopolitan and who could often be found hosting salons where she and her friends would drink tea and discuss literature. When Nellie Bly announced her plan to circle the globe by traveling East, Elizabeth Bisland’s editor sent Elizabeth in the opposite direction with the goal of beating Nellie Bly’s time. Nellie travelled first by steamship across the Atlantic, and Elizabeth began her journey traveling by train across the United States. The two encountered seemingly insurmountable obstacles in completing their assignments, but determination and strength of character in each woman brought each of them safely back home. The suspense built throughout the book as each of the travelers made and missed crucial connections in their around the world itinerary. The suspense didn’t wane in the final days as each of the women raced toward New York City. The trips were not without planned interruptions, though. Nellie Bly was able to schedule a visit to Jules Verne’s country home, where she met Verne and his wife. The end of their historic journeys is not the end of the book, because the author shows how fame or the lack thereof causes each to spend the rest of her life affected by the results of the race. For one, it is the peace associated with resigned acceptance, for the other it is the devastation caused by the consequences of celebrity. Goodman’s book presents itself as a factual account of a historic publicity stunt, but it is so much more. It is really a detailed treatise on late 19th century political, social, economic and technologic conditions in the world. It reads like an adventure story as the women race through unfamiliar and often dangerous locales, but it is packed with facts about events, innovations, and famous people. It also discusses women’s rights, the plight of immigrants in America, Opium Wars in China and dozens of other aspects of the times. Goodman’s skillful ability to incorporate comprehensive research and first person accounts into an engrossing narrative, combined with Kathe Mazur’s effective portrayal of the heroines gives the listener the feeling of actually accompanying the women on their journey. This entertaining and informative audiobook would make a wonderful gift for anyone, but especially for travelers and history buffs.